Last year I wrote about blog post called “The Power of Yet!” which chronicled Oneida Tommy’s unsuccessful attempt to earn the rare “Archer’s Hand” at Camp Ockanickon. As you may recall, the “Archer’s Hand” is when one earns all 5 archery emblems in the same summer. Tommy had earned 4 of the emblems from our Emblem Guide which at Ockanickon is a guide of challenge goals, but the emblem for Everdeen Archery (our 3-D archery course in the woods) had eluded him. I wrote about how Tommy tried multiple times that summer, and came so close, but ultimately was unsuccessful. However, I was impressed by his attitude and perseverance, as Tommy understood the “power of yet” and knew that he had only not earned the emblem “yet”, but that he had the opportunity to keep working at it, and would try again in 2018. At Camp Ockanickon, our campers have the opportunity to review our “Challenge Goals Guide” which lays out what needs to be done to earn an emblem in several different categories including athletics, nature, art and creative, adventure, character, and more. Within each category are a series of emblems which can be earned when a camper demonstrates mastery of an activity. For example, one can earn an emblem in canoeing by identifying the parts of the canoe and paddle, demonstrating proper forward and backwards strokes in the water, along with proper “C” and “J” strokes, canoeing from Ocky boating to around Chapel Island and back in under 8 minutes, and canoeing from the Ocky Boating Dock to Senior Bridge and back within 50 minutes (essentially navigating the “Amazon” at camp). In Tommy’s case, he had worked in 2017 to earn the Everdeen Archery emblem which could be earned by completing the 3-D archery course with a sufficient score that demonstrated mastery of speed through the course, ability to quickly nock an arrow, and ability to accurately shoot and hit targets in the woods quickly. Tommy came close multiple times, but was always a few points shy of earning the emblem. However, Tommy returned in 2018 and was determined to give it another shot. He had already proven his meddle with the other 4 archery emblems the summer prior, and was able to earn them again in 2018. However, Everdeen continued to elude him during the week. I saw him Thursday of the 1-week session, and he was strategizing with several other Oneida campers on how to earn the emblem. These campers were his allies, and were helping him on his journey to achieve his goal. 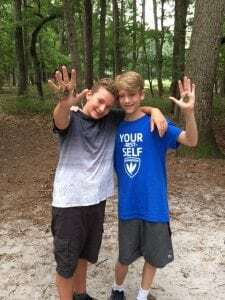 Tommy strived again with the help of his allies, and ultimately on the Friday of the session was able to earn the Everdeen Archery emblem – thus completing the rare Archer’s Hand! Congratulations to Tommy and his allies who helped him strive again, and to believe in his best. The joy and accomplishment on Tommy’s face, and on the faces of his allies, was clear and rewarding. Perhaps my favorite part of listening to Tommy and his fellow campers talk about their success Saturday morning was hearing the group talk about what their goals would be for 2019 Summer, as the journey to being your best self doesn’t end!